OTTAWA — Stephen Poloz has kept markets on edge ever since an unexpected chop to the Bank of Canada’s key interest rate in January — the first adjustment, up or down, in four-and-a-half years. 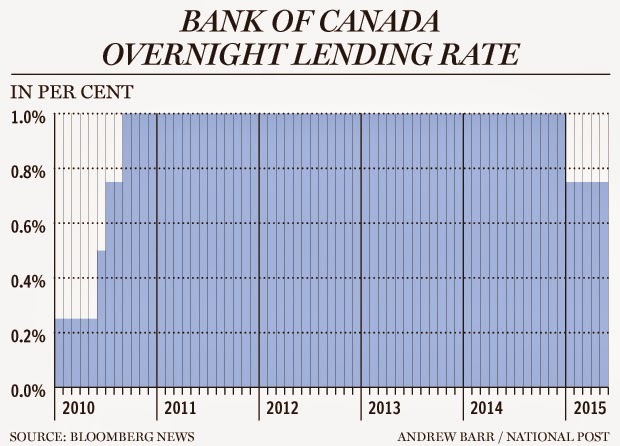 The Bank of Canada governor and his policy team are likely to keep their options open on Wednesday, maintaining the trendsetting lending level at 0.75 per cent — down from the one per cent set in September 2010. Poloz has said the “insurance” cut is working for now. But plenty has happened since the central bank’s surprise 25-basis-point cut in the rate on Jan. 21. The Canadian economy has been sideswiped by the global collapse in oil prices, threatening to pull resources-dependent Alberta into recession, perhaps Saskatchewan along with it. It hasn’t helped that the U.S. economy also got off to a slow start in 2015. Now, bank watchers are waiting for the other shoe to drop — or, more likely, to go up. We asked some of Canada’s top economists to take stock of the Bank of Canada’s policy decisions this year — their effectiveness and where the key borrowing level is heading next, and when. Click here to read what the top economists say about the Bank of Canada's policy!